I grew up eating porridge, especially in the cold winter months. It was a staple in our house. I can remember my Mum pouring the oats from a big red box into to microwave dish, adding water and a pinch of salt. She then popped them into the microwave to cook, you only had to wait a couple of minutes. The porridge would appear in your bowl all warm, gooey and delicious. This breakfast would quickly fill you up for the long day of school ahead. This was the 80’s way of preparing and enjoying oats, these were rolled oats. It was the age of convenience. These oats were a great source of beneficial nutrients including fibre, B vitamins, vitamin E, minerals, healthy fats and antioxidants. So, they were a great start to the day. However, rolled oats are an edited version of the original oat. Rolled oats are a processed food. They are steamed, rolled, steamed again, and toasted before they are ready to be eaten. This modification is done to change their original taste, texture and cooking time. It also means the wonderful nutrients are unfortunately modified as well. In the 90’s things got much more convenient, rolled oats were out of fashion because we now had instant oats. These babies were super fine and super quick to prepare. Also, they now came in sweet flavours and packed in convenient little packets. But now they were even more processed with added ingredients like skim milk powder, sugar, preservatives and emulsifiers. This breakfast dish was no longer gooey it had moved straight to mushy. I can admit I ate these for years. Thinking they were a healthy option. Boy was I wrong! When food evolves over time you often don’t see the change happening. It’s the old frog in a pot of boiling water scenario. When I began making changes to our household from a home riddled with chemical, toxins and a pantry full of preservatives I made a conscious decision to take things old school. By this, I mean pre- 1970. I found taking a look at the past and how my grandmother prepared food gave me inspiration and clarity about what kind of home I wanted for my family. I wanted my family to continue to eat porridge. My new knowledge of processed preservative packaged food meant I could no longer serve what I was buying from the supermarket. I needed to find the best version, the original version. These chunky oats are as old school as you can get, they are incredible. Steel cut oats are known as a power food. They pack a hefty punch. They are dense and wonderfully chewy. They are not steamed, rolled, steamed again and toasted. They are simply in their original form and they have been chopped into two or three pieces. Steel cut oats are packed with fibre, B vitamins, vitamin E, minerals, healthy fats and antioxidants. Similar to rolled oats but with more bang for your buck. Steel cut oats also have a lower glycaemic index, this means your blood sugar won’t spike after eating them. They keep you feeling full for longer and they have a hearty, pleasing texture and nutty taste. The best part is they are the original, no modification, just pure and perfect. I can see why porridge has been modified over the decades. As I mentioned earlier porridge was modified to change the cooking time, making them thinner and smaller meant they can very quickly be prepared. You can have a warm bowl of sweet porridge in 90seconds. But so much gets lost when convenience comes before nutrition. 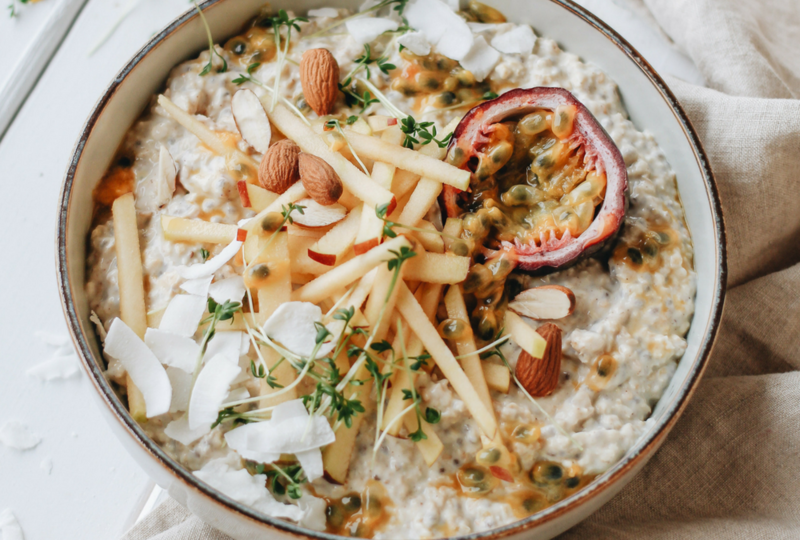 Thankfully steel cut oats are making a very strong comeback, there are fabulous brands easily available to purchase and preparing them is not difficult, it just takes some planning. One way to cook steel cut oats is to soak them for several hours and cook slowly over a low heat. I often make them this way. Prior to going to bed, I soak 1/2 a cup of oats in filtered water. I place the oats in a small pot and cover them with the water until just covered. I seal the pot with the lid and off to bed I go. In the morning I add ½ a cup of full-fat organic milk, place the oats over a low heat and cook for 15 minutes or until creamy. I serve with sliced banana, crushed macadamias and a splash of maple syrup. So yummy! However, there is a brilliant much more convenient way to cook steel cut oats. You can cook them overnight in your slow cooker. This method is mouth-watering. You wake in the morning with the house smelling warm, delicious and comforting. Breakfast is all ready and waiting for everyone to come and enjoy with no stress. Food can be tricky, it takes so much time, consideration, preparation and it’s costly. Often, we don’t stop and have a look at what we are doing, there’s no need because it’s working. However, there are opportunities to make better choices if you want to take a closer look. I know my family has been much better off since we began to take it back to basics and I’m so pleased I could share today’s post with you, I hope it has given you a dose of inspiration.